This brand new, enormous, mediterranean-style resort in Del Mar was the first hotel and spa in the U.S. to receive Forbes’ highest triple five star rating. This upscale San Diego wedding venue, which cost 270 million dollars to build, has been the site of celebrity events and weddings. Tucked deep into the Los Peñasquitos Canyon Preserve, this extravagant resort and golf club is surrounded by the calm of nature not too far from Downtown San Diego. There are two outdoor ceremony sites at The Grand – the Aria Lawn and the Reflection Lawn. Couples are framed by an impressive Moroccan pavilion on the Aria Lawn and there is a long fountain pool and gazebo at the reflection lawn. Both sites can be photographed from above. The popular indoor wedding venue is the Capella Chapel, good for low-light, moody and intimate photography. What’s most impressive and photogenic about The Grand is the interior of the resort and wedding venues. There are three locations available for wedding receptions – the Capella Chapel, Elizabeth Ballroom and the Manchester Salon and Terrace. 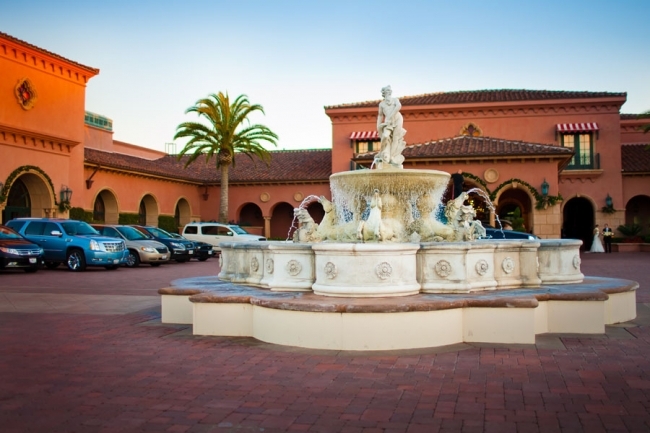 The Elizabeth Ballroom is 10,000 square feet and can hold weddings as big as 600 people. … We never felt intruded upon, yet you managed to capture some very intimate moments. You felt like a very welcome guest! © Brett Butterstein Photography, All rights reserved. Sitemap. Website by Kristin Falkner.